After watching a charity basketball game in San Juan, a place I rarely go to, I decided to eat at a place where I rarely or haven't gone to as well. Just a walk away from the San Juan Gym, here inside the Agora Complex, I found my victim errr my food choice. 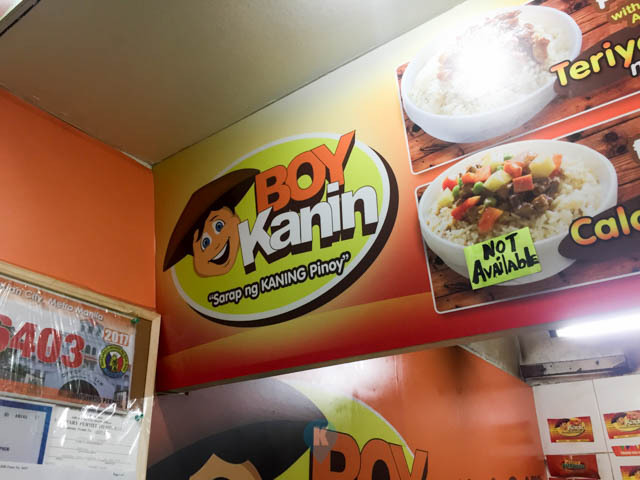 Its called Boy Kanin. 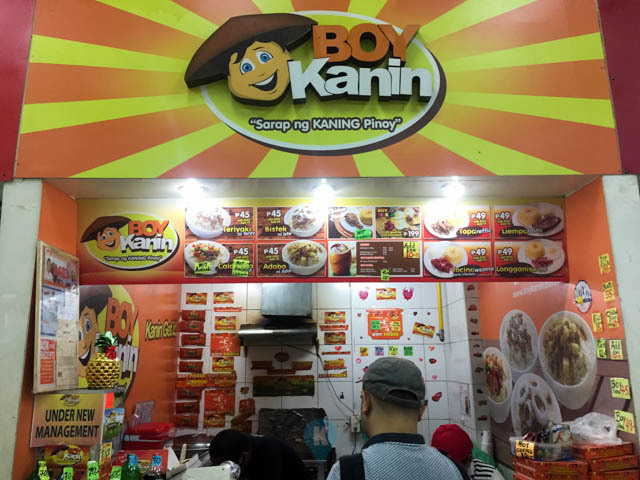 The cashier told me that this was a franchise and had different branches already scattered in metro manila. However true, this is my first encounter with Boy Kanin so I dug in. Looking over the prices, I was surprised with the low prices for a franchise. 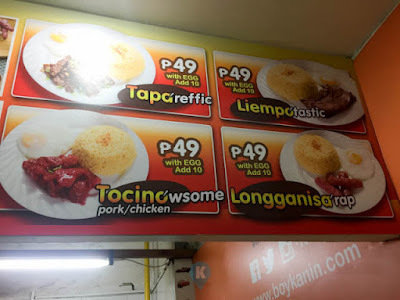 I took out liempotastic worth Php49. Although I was deceived by their photo. It showed a dish with egg and I thought there was one. When I ordered it, late I realized the small print "with EGG Add 10". I read it as P49 with EGG only to know the next line reads add 10. 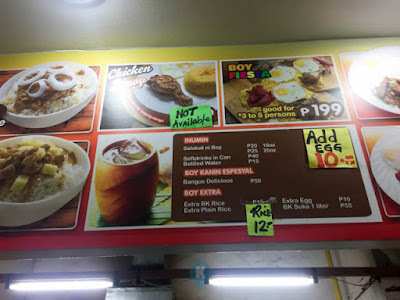 I don't like this kind of advertising frankly but since I was hungry and the total of Php59 is a measly amount, and I don't want to branded as kuripot by the cashier, I said yes please add the egg. I prayed that the liempo would at least justify my decision to eat here. When the order came, I was frustrated and excited at the same time. The serving size for the liempo was a let down for me. It was thin and just a few slices of it (score -1). I was excited to see that it had fried rice with it. 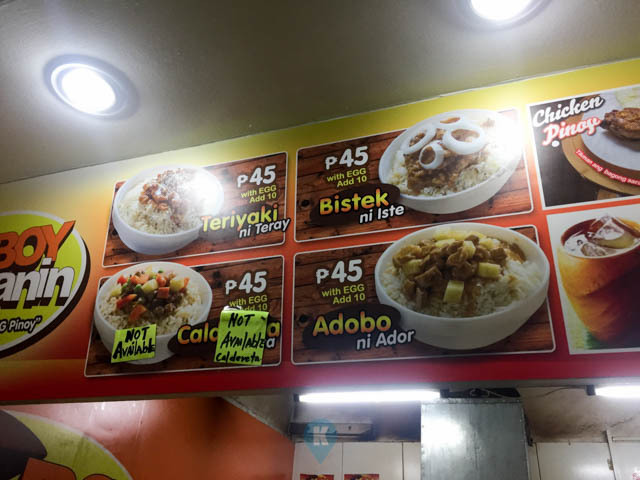 Usually restaurants change the rice on the pictures to steamed rice to cut down on costs. So this was a great find for me (+1). So that somehow evens out the equation. 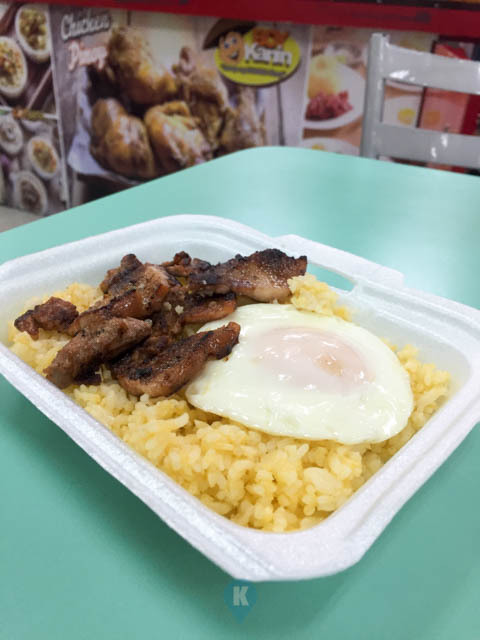 I was glad I ordered the egg as I know the liempo won't tide my hunger over (+1). The egg was cooked plainly like the way I do it at home. The order came after few minutes or so, but the wait was bearable (score +1 -1). Being inside the Agora Complex food court, I next realized they don't have a water fountain or dispenser. You have to buy bottled water or softdrinks from the kiosks inside (thats a -1). Total taste for the liempo, nothing especial. They had a marinade on it that tastes like tapa so I don't know how to describe it. Is it a fried liempo or a tapa liempo (Score -1). Overall dining experience was just so-so and with the price point, I was expecting it to be crappy but it wasn't. Just don't expect to be filled though. If you like to be full, then order two dishes from them and it will be cheaper compared to a meal from popular food franchises. I said you will be full, but I can't guarantee you about the taste. We will come back for sure and order two dishes here, definitely not the liempostatic. Total Score is a -1 in my taste rating. Disclaimer - I'm no food critic nor expert. I'm just a regular joe who gets hungry and would like to get the best meal for my measly peso.